Bought this for my daughter for Christmas....it is what she has wanted for about 8 months now. I bought two different brands for her to choose from and this one was the better of the two. The other one was so see through when held up to light compared to this one...this one had much better filling. Sleep in fluffy comfort with this down comforter from Hotel Madison. 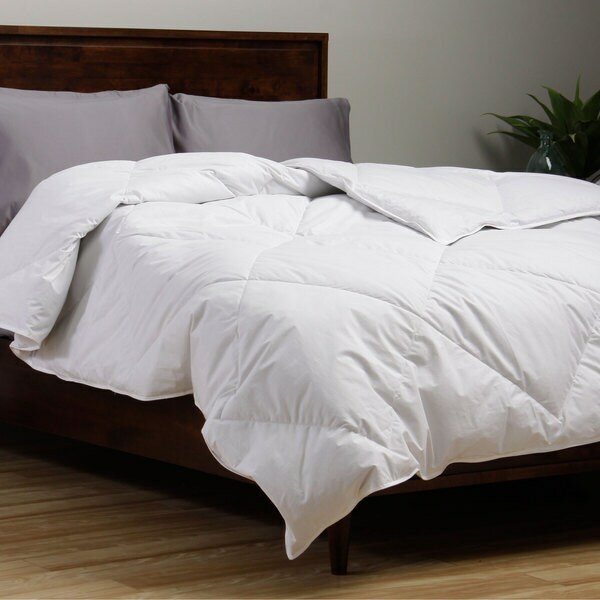 Filled with duck down, this white comforter keeps you toasty warm on cold winter nights, and a diamond box stitch construction ensures that the down stays evenly spread. The white cover is made from 100 percent cotton, giving the comforter a soft feel. This twin comforter was super small -- six inches smaller in each direction than the duvet cover I wanted it for. I didn't know that "twin" sizes could vary so much! It is light enough to use in the summer, I live in the midwest so it does get warm, but this one is nice and light enough for that and into fall. its perfect. just the right weight. LOVE the weight of this blanket. Great quality! Weather appropriate for winter or summer in south Mississippi. Unfortunately, the size is too small for our king bed. It doesn't hang over the edge - it barely reaches the edges which means my husband and I are constantly fighting for blankets. I'll have to up-size but plan to use this on our guestroom queen bed. I was looking for real down comforter not super expensive. This comforter Is heavy, I'm not sure about "All seasons", but when I used on winter - was very hot under comforter and I was sweating (I live in MA), I'm already put in storage, no way you can use in spring/summer. light, warm but smaller than expected for a Queen. I am happy with the quality of the comforter. It's light but warm... the only thing I am disappointed in is the size. I bought a Queen and it's a bit small for a Queen sized bed. Good, standard down comforter! Recommend inside a duvet cover. I purchased about a year ago and while it's understandably lost some fluff, feathers are still holding up well. Faint smell of feathers so I washed in light load and dried in dryer! not only did this puff up to better than my expectations but the weight is perfect! i love this so much and the price was so right on! We are thrilled to have purchased this item. "Is the outside of the comforter "cool" to the touch?" The comforter is cool to the touch if it has been left in a cool room unused. "I don't see any down comforters with corner tabs for duvet covers, am I missing them? Can you recommend any?" According to customer reviews, item# 17176093 has corner tabs to hook into a duvet. Or if you don't mind down alternative item# 17715043 has them as well. I wanted a lightweight (Summer) down comforter. This is the first duck down comforter I have purchased. All others are 100 percent goose down. I hope it's as good! "whats the percentage of down to feathers." Hi ebechan, this comforter is 75% down. I hope this helps, thanks for shopping with us. "Some comforter fabrics are noisy and stiff. How would you describe this one?" Hi johnmon, in my opinion this comforter is soft, warm and cozy. I hope this helps, thanks for shopping with us.